I have no idea why but this equation from the wonderful broadcast news satire, “The Day Today”, just popped into my head. Yes, fact x importance equals NEWS. If you don’t know “The Day Today”, here’s a short clip for your viewing pleasure. 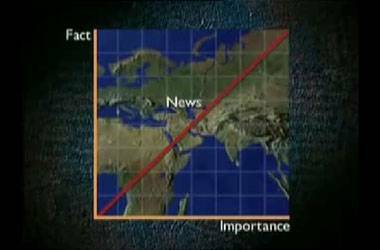 Of course, whilst The Day Today, back in 1994, seemed like a heavy exaggeration of how news was presented, well it probably doesn’t even seem that exaggerated when compared to today’s overblown presentation methods.